OPSEAT Grandmaster Series 2018 Review | Nerd Much? When you spend just about all day at a desk for five days a week (first working all morning and afternoon then gaming all evening), having a comfortable chair is important. Otherwise, you’ll find your back hurting or arms and shoulders feeling tired from trying to find a comfortable position. But finding the right chair for you can be tough, as everyone likes to sit differently. And, if you’re a bigger guy like myself (pushing ~265 lbs), it makes it all the more difficult to find a chair that’s made for larger than average people. Of course, there’s more than just comfort to consider, especially if you’re a Twitch streamer or you do other live streams. Style likely also has a hand in your gaming chair selection process. 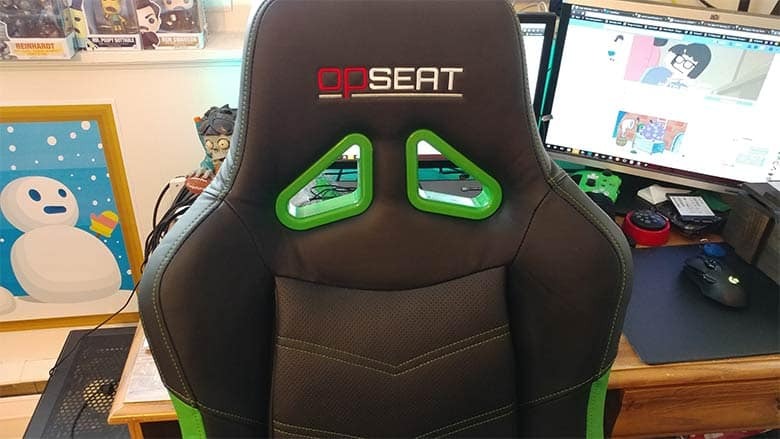 We were recently sent OPSEAT’s newest chair, the Grandmaster Series (2018 edition), to review, and I can comfortably say (pun intended) that it’s the best sub $300 gaming chair we’ve tested to date. It’s a chair that’s intended for bigger folks such as myself, and it definitely has the build quality needed to support that intention. There are a lot of reasons to love the Grandmaster Series chair, and we’ll certainly get into all of those shortly, but if you want the quick TL;DR version, here it goes. After using it in the office for the past week, we’re able to tell you what it is that makes it a clear standout in our book: premium quality for a modest price. TL;DR: Premium quality for a modest price. To start, putting the chair together was par for the course. The instructions were seemingly not in the box, which I thought was a bit of an oddity, so I found them online on the official OPSEAT website. However, that wasn’t actually the case, as I found the instructions on the button of the cushion (you’re welcome!) when I began to put it together. Silly me. Luckily, the chair’s assembly instructions weren’t complicated, and if you’ve ever put any standard gaming chair together, you’ll have no issues here. From start to finish, the process took us 25 minutes total (and that’s with us realizing we had mixed up the screw sizes half way through its assembly). The end result is a high quality-looking gaming chair, complete with racing vibes and a colorful design. Ours was Nerd Much? green, black and gray, and one thing that’s a standout here is the colored stitching that gives it a bit more in the aesthetics department. It’s that extra step that, while subtle, you’ll definitely appreciate as an owner of the chair. Once I had it assembled, I immediately had to take it for a test drive. And after kicking the tires, I’m really impressed with the comfort and customizable positions. Most of the options are common, like the height of the chair and how much it reclines. Hell, you’d likely even find adjustable arm rest height on some gaming chairs. But what you likely won’t find is the adjustable angle of those arm rests. The arm rests can not only adjust up and down, slide forward to get the best position, but they can also tilt about 30 degrees left or 30 degrees right. This provides a PERFECT position for gaming with a mouse, allowing your arm to rest at desk level and at the best angle for using a mouse. Awesome. It was discovering this that made me decide that this was the perfect chair for me. Also worth noting is that this chair has a flatter seat than OPSEAT’s Master Series, which has a more prominent racing style bucket seat with sides that flare up slightly. The Grandmaster Series chair is perfect for those, like me, who prefer to sit cross-legged and not with their feet directly on the floor (I typically sit with my left leg underneath me as I type). The chair also comes with a head pillow and a back pillow for added comfort. However, I personally preferred the chair without the back pillow. Not that they’re uncomfortable by any means, it’s just that my personal preference is a pillow-free chair (again, because I sit to the very back of the chair so that I can put one leg up). I was also impressed with how well the chair was able to move on our laminate flooring at the Nerd Much? office. For those unaware, certain chairs can be hit or miss with their wheels on laminate flooring because of how smooth it is in comparison to typical office flooring or one of those rubber mats (I don’t use one; never liked them). And while this chair’s wheels don’t look like anything special, they glide notably well. When reviewing anything here at Nerd Much?, we try hard to find at least something negative to mention in the review — even when we’re reviewing a product we might love. 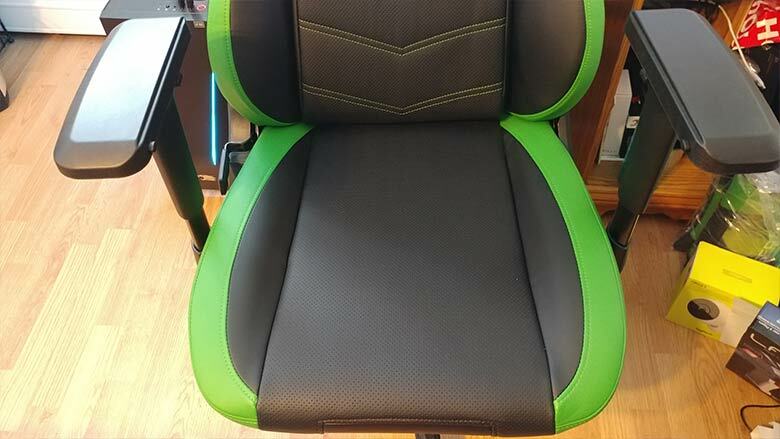 But with the OPSEAT Grandmaster Series chair, I honestly can’t find any flaws. It doesn’t have any bells and whistles like backlighting (yes, that’s a thing now) or speakers, but it’s incredibly comfortable, easy to assemble, stylish, and it comes in at less than what you should expect to pay for the quality you’re getting. For those reasons, OPSEAT’s 2018 Grandmaster Series gaming chair gets the Nerd Much? Gold Seal of approval. Available on Amazon for $249.